ClimateWorks’ sustainable business practices reflect our commitment to climate action. ClimateWorks’ office has a bright and healthy atmosphere and uses two-thirds less energy for HVAC and one-third less energy for lighting, compared to a typical California office interior. When we began work on our office space, we recognized the one-time opportunity to put into practice our commitment to energy efficiency and to showcase sustainable building materials and techniques. Among the many features of ClimateWorks’ LEED-Platinum certified space, our office has extensive daylighting and advanced lighting sensors, reducing energy use for lighting and improving our staff’s well-being through access to natural light. The construction utilized sustainable building materials, including locally manufactured furniture, Forest Stewardship Council-certified wood products, and materials made from recycled cork, denim, and office paper. We incorporated operable windows, which take advantage of San Francisco’s mild climate, to minimize the need for air conditioning. Sourcing innovative low-impact products and technologies, our team of architects and builders demonstrated an unwavering commitment to sustainable building. 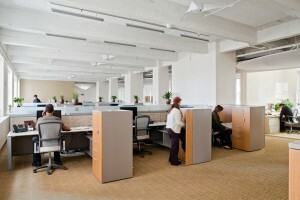 Their efforts earned the ClimateWorks offices LEED Platinum for Commercial Interiors certification. If you’d like to arrange for a tour, please contact us to schedule a time. As an organization, ClimateWorks is committed to being carbon-neutral. We offset our greenhouse gas emissions from air travel and electricity use in our office with Verified Carbon Standard credits purchased through Terrapass. These credits support clean energy from wind farms in the U.S. that helps lower the proportion of electricity derived from dirty power sources like coal.